As proved by his cuisine, Takeshi Kubo is a purist who believes in cooking with the best possible produce. From wild suppon turtle in the spring to mackerel pike in the winter, the chef of two-star Goryukubo knows when and where to look for the tastiest treasures across the Japanese seas. Curated on a breathtaking collection of antique tableware, the deepest flavors of the seasons unfold here. 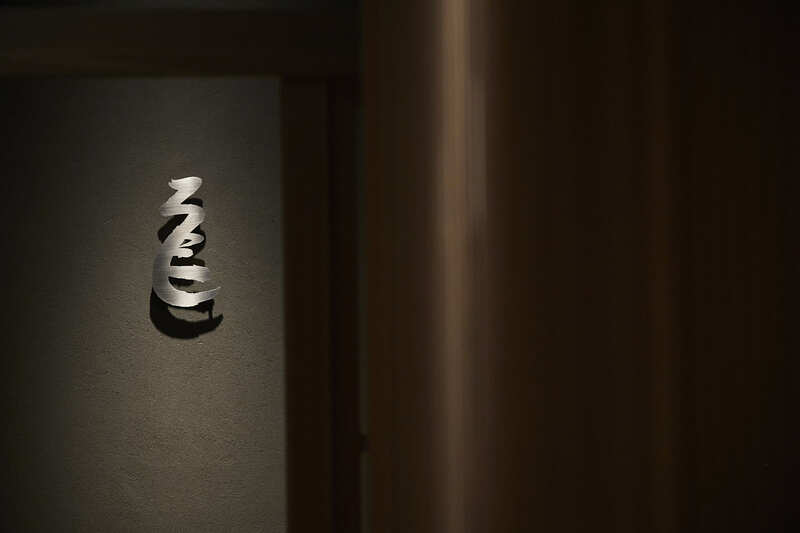 The gourmands were quick to spot this hidden Tokyo restaurant, with Michelin awarding two stars just within 7 months of its opening. It sits on a quiet backstreet just off the main Nishi-Azabu crossing, alongside with some of the most sophisticated restaurants the city offers. “This area has such a high concentration of incredible restaurants and I wanted to be a part of that scene,” Kubo says. Following the gently-lit lanterns, you find your way down a narrow flight of steps into a basement of a building. 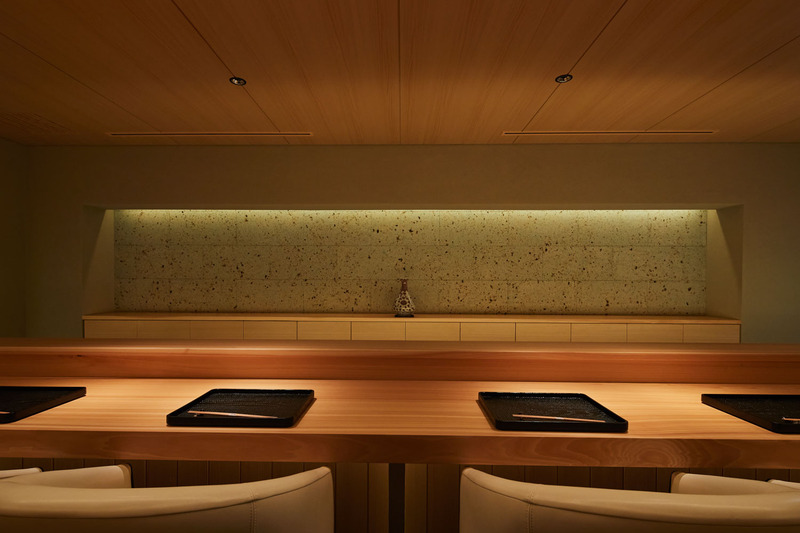 Inside is a peaceful wooden Japanese interior with soft-lit walls and linear paper shades. A beautiful counter stretches across the main room while the smaller private room offers an intimate setting. One of the apprentices has arranged a single red flower in a thin vase behind the counter, symbolizing the arrival of spring. Quality and perfection—the philosophy behind the cuisine is simple. Yet the entire ambiance is subtle and minimalist, reflecting the chef’s modest disposition and his tendency to avoid big appearances on the media. The name Goryukubo combines characters for Kubo and his son, reflecting his wish that he wants his restaurant something he can truly call his own. Also the symbol for dragon, there’s a solid sense of strength in the name. He seeks for premium ingredients that can make Japan’s beautiful seasons come to life. The courses are carefully defined and beautifully crafted, making you hold back your breath as each dish is brought in front of you. After your visit, you find yourself returning again to enjoy the best of another season. 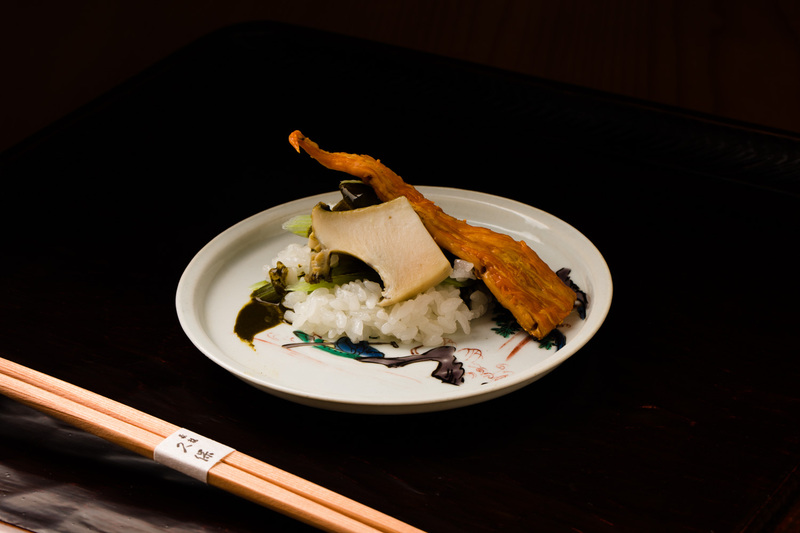 Kubo seeks for authenticity in his dishes and doesn’t believe in extravagance. The root of his cooking is traditionally Japanese but you can immediately sense his amazing style to incorporate new ideas to his own cuisine. Bringing together different flavors, the abalone dish is to be enjoyed multiple folds. The pieces of abalone have been steamed for as long as 6 hours, giving them amazing softness while retaining all its umami inside. They sit on a heap of sticky rice that has absorbed the flavor of the sake. On the side is a stick of seared bachiko, a sea cucumber delicacy, crispy on outside but raw on the inside. Its delicate saltiness adds a beautiful accent. A plump piece of tilefish is first fried then marinated in dashi broth, infused with the deep flavor of dried tuna flakes and coupled with a square of kamo-nasu eggplant. The dish is topped with a pile of spring onion strings and aromatic kinome herbs for a refreshing contrast. Next comes a series of grilled dishes, which have become Kubo’s signature technique. Of the dozen dishes on a course, about 3 usually come from the grill. “I love grilling using binchotan,” a type of Japanese charcoal that produces virtually no flames and no smoke, Kubo explains. The black throat sea perch is grilled to perfection. The skin is black and crispy while the meat is sweet and soft. The shiny glaze combines the sweetness of the fat and soy sauce. Next come thick pieces of marbled Ohmi wagyu beef, the edges slightly burnt and inside pink and moist. 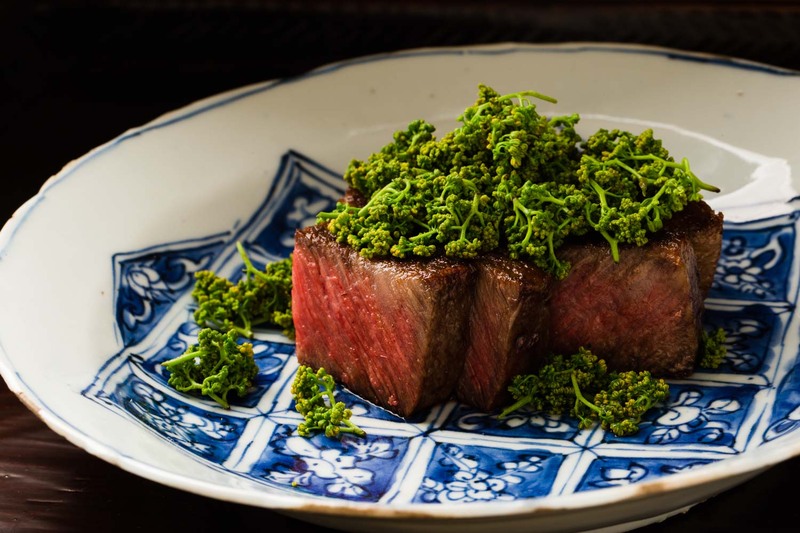 The soft and juicy slices of tenderloin and rump are covered in seasonal “hana-zansho” (sansho flowers) that add a refreshing kick to the sweet fat of the beef. The meat is cooked flawlessly, using binchotan charcoal that has been resting six or seven times for it to be at the perfect temperature. “Cooking is all about the people,” Kubo believes. For that reason, he has deep respects for producers. Without their passion in producing the best ingredients, there is no ultimate cuisine. He stays in close touch with each producer to exchange updates on the produce and share feedback from the guests. The constant communication yields deeper relationships. Thanks to his extensive research, he can map out the best produce across the country. 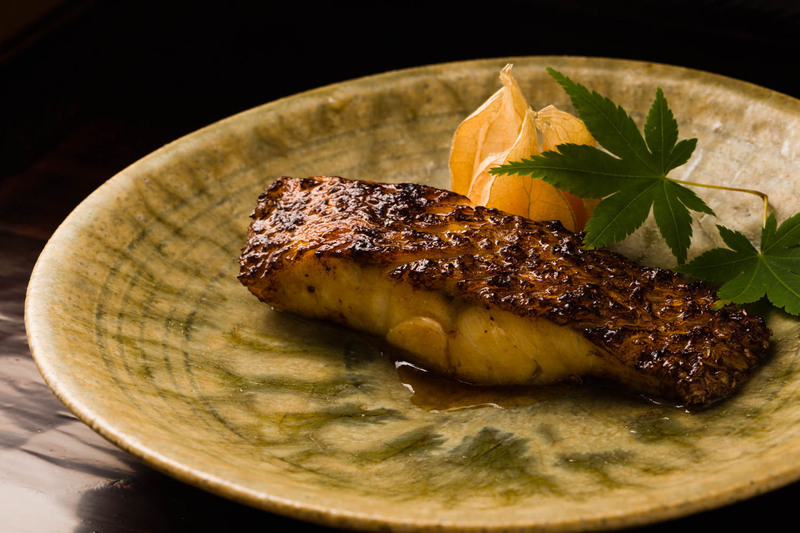 For spring, his top picks are fat greenling from Aomori, snapper from Awaji, white shirako bamboo shoots from Kyoto and usui endo shoots from Kishu. Summer brings wild softshell suppon turtle from Kumamoto, fat eel from Lake Shinji, pike eel from Amakusa, sweetfish from Nagano, abalone from Awaji, kunukawa eggplant from Ehime. In the fall, Kubo has his eyes on returned pike eel, again from Amakusa, matsutake mushrooms from various mountains, returned bonito, mackerel pike from Hokkaido. 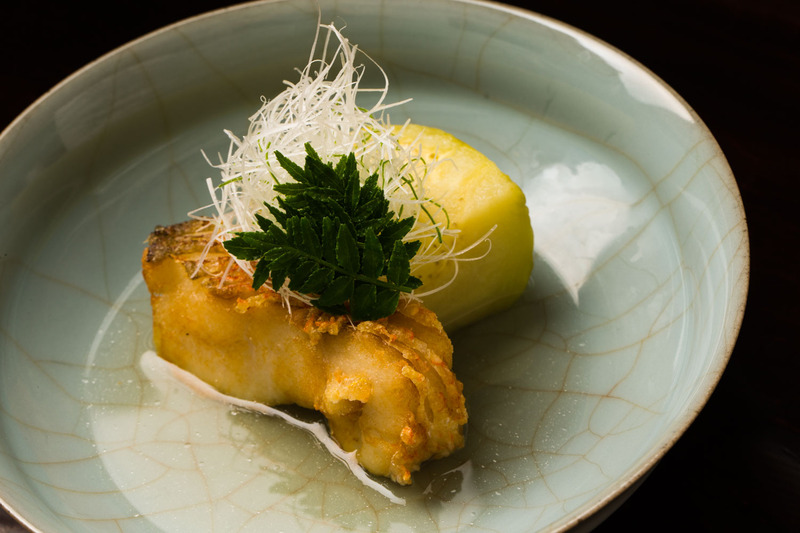 The best of winter includes wild tiger pufferfish from the Bungo channel, rosy seabass from Choshi, Matsuba crab from San’in, surf clam from Oita and colorful Kyoto vegetables. Each season brings a new course to Goryukubo as well as dedicated fans who continue to come back throughout the year. For fish, Kubo thinks freshness is the most important, and sources directly from various ports across Shizuoka, Kyoto, Ehime and Kyushu. Not only does he buy from famous locations but tries to seek for new channels. Lately, he’s had some great finds among the day’s catch from the port of Yaezu. The beverage collection is also impressive. There must be at least 20 different brands of Champagne alone. The sake menu features famous bottles like Dassai and Juyondai but also some from boutique breweries. Just like his ingredients, he enjoys sourcing the best drinks from around the world. Born in Chiba, he was an active and energetic boy, leading him to pursue studies in martial arts. But soon after graduating college, he hurt himself in a bad injury, forcing him to seek a career elsewhere. He thought about enrolling himself in a culinary school but felt it was too late for that so instead he began training at various restaurants across the city. It was not an easy start when he opened the current restaurant in May 2013. During the first 6 months, only a handful of customers walked through the door. The big accomplishment of winning two Michelin stars also didn’t lure many fans immediately. “But looking back, the tough times pushed me to focus my whole being on the cuisine,” Kubo recalled. It helped the restaurant become what it is today, he says. His beloved son is now in middle school and often tells Kubo that he wants to take on the restaurant someday. As a parent he would never throw a child into the tough world of chefs but deep down he feels happy to hear his son’s wish. On days off, he spends most of his time with his three children as well are try new restaurants, including a monthly trip to Tokyo. He is also drawn to the sophistication of many Kyoto restaurants. As he has never trained in Kyoto, he tries to make visits there often, not only to restaurants but also museums, tool stores and other craftsmen. “I strive to pursue for something truly genuine that I can pass onto the next generation.” Kubo reminds himself. “It’s important for me to never be satisfied with now but continue to want to evolve.” He thinks he can improve the atmosphere of the restaurant and is eyeing a relocation within the Minato neighborhood. 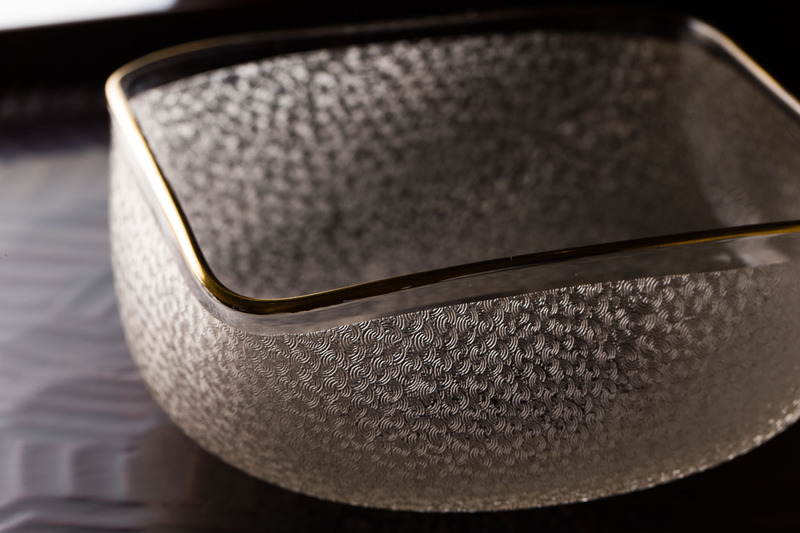 Just like the cuisine, Kubo pursues for perfection in tableware. He usually finds his treasures at a store in Kyoto. 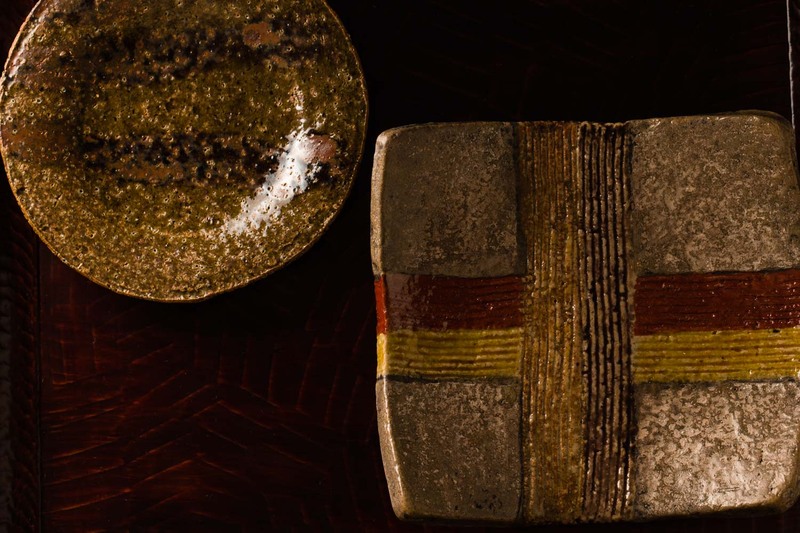 In particular, he is proud he was able to locate 15 pieces of the rare glassware that were custom ordered by Harumi Shoten, a famed antique merchant. The intricate design and curve of the square bowl are simply magnificent. He also admires the work of Kitaoji Rosanjin, one of the greatest modern Japanese ceramists. Reflecting the artist’s breath of style, he has collected the famous circular designs as well as other simpler pieces. He has also acquired a number of ko-sometsuke and ko-kutani porcelain dish from late Ming period. His collection has now become so extensive that he stores the pieces in a separate storage in the building next door. Like everything else, the best cuisine only deserves the best.